The Islamic Cultural Centre in London in collaboration with the Council of British Hajjis UK organised a One Day Seminar and training Session for British Muslims enquiring on undergoing their Hajj Pilgrimage for the year 2017/1438. The Event was attended by over 250 people and encompassed a variety of different topics which included; Health and Safety at Hajj, Advise on booking Hajj packages with licensed agents, how to look out for fraud and also safety tips from the local city of London police. 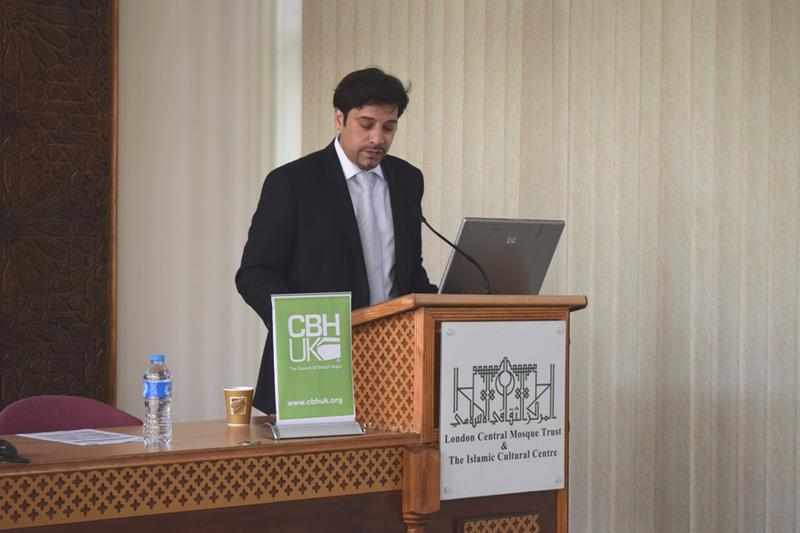 The event was opened by Mr. Ayaz Zuberi - Head of Public Relations at the Islamic Cultural Centre & London Central Mosque who conveyed the Director General Dr. Ahmad Al Dubayan's best wishes and congratulations on all Muslims who are planning to undergo their obligatory pilgrim in The Holy Sites of Islam. Mr. Zuberi mentioned how Hajj is journey which is not only a physical journey but has a very spiritual component about it too. Mr. Zuberi said he was very honoured and proud to have lead the British Hajj Delegation in 2016; an organisation that looks after British Pilgrims on Hajj on an annual basis. Mr. Zuberi highlighted that the Delegation was responsible for over 19,000 British Pilgrims in the last year Hajj season 1437 Hijri and that the delegation had meetings with high level stakeholders including the British Consulate in Jeddah and the Minister of Hajj for Saudi Arabia. Mr Zuberi said "We are very fortunate to have His Royal Highness Prince Mohamad Bin Nawaf Al Saud's support & continue to work closely with the Saudi Embassy in London. We also have a close working relationship with Consul General Barrie Peach from the British Consulate in Jeddah to ensure the highest standard of service are provided for the British pilgrims." 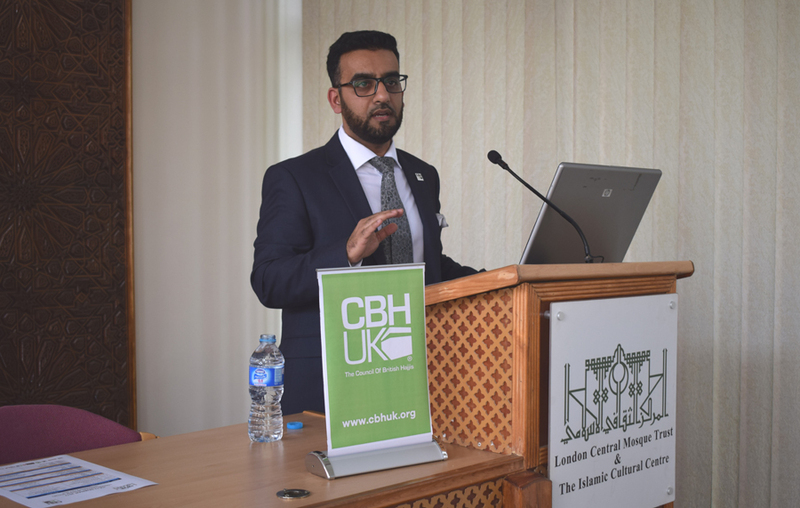 Mr. Rashid Mogradia, The Chief Executive Officer and Founder of the Council of British Hajjis UK thanked the Islamic Cultural Centre for hosting today's session which is of significant importance to all perspective Hajj pilgrims. CEO Mr. Mogradia echoed the words expressed on the British Hajj Delegation and it importance of supporting and looking after British Pilgrims on going to Hajj. He then hoped everyone would find the event to be both fruitful and productive in learning about the essential steps and procedures for going on Hajj. The Event was followed by a series of sessions which covered different aspects of Hajj and welcomed Imams from the Islamic Cultural Centre who were able to answer religious questions the audience had. There was also Health Care Advisors who were able to give our vaccinations for the perspective Hajj pilgrims and stalls from licenced Hajj & Umrah Tour Operators in the UK.